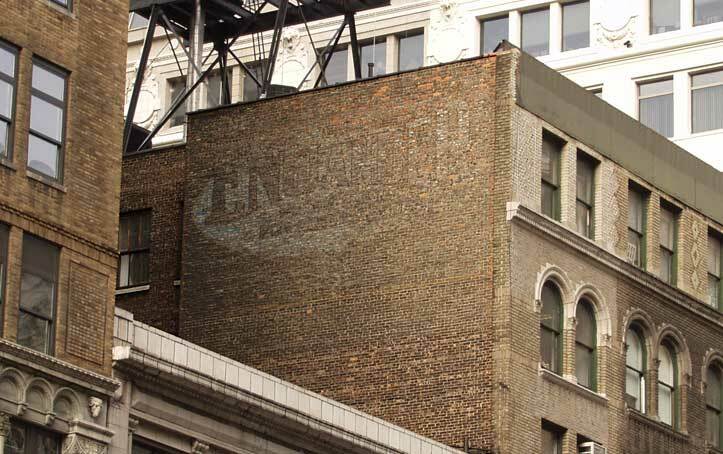 ENGLANDER / Productions for / Sleep and Rest on this wall overlooking Sixth Ave. at 32nd St. marks the building where the Englander Spring Bed Co. maintained show rooms for furniture from 1919 until around 1950. Max Englander (1872-1955) was born in Hungary and came to the US at the age of 13. His business, founded in 1895, "Furniture, Upholstery" is listed in the New York Telephone Company directory at 145-9 W. 18th St. in 1898. He continued at this address until 1903, when he moved to 19th St. and opened a show room on 7th Ave. Then in 1909 he expanded his business to found the Englander Spring Bed Co. at 311 W. 15th St.
Two years later Englander left Manhattan for Brooklyn, locating first in Bay Ridge (1911), then near Bush Terminal in Sunset Park at 88 35th St.(1912), and finally at Johnson & Stewart Aves. in the East Williamsburg section (1920). Click here for Englander Johnson Ave. sign. . By 1920 Englander had branch factories in Chicago and San Francisco, and had opened his show room in the building above. Click here for Englander ad from Manhattan Telephone Directory 1920. A photo dated 1929 by Percy Loomis Sperr (1890-1964) in the New York Public Library's Digital Collections shows an Englander Beds sign just above the third floor windows on the 6th Ave. facade of this building. For more on the history of Englander see The Mattress of Choice. This building was demolished in mid-2008, yet another victim to the almost total obliteration of 6th Ave. north of 23rd St. that took place in the the early 2000s. This Englander advertisement appeared in The pictorial history of Brooklyn: issued by the Brooklyn Daily Eagle on its 75th Anniversary, October 26, 1916.